Welcome to April! This month brings us to a pattern that is perhaps a bit controversial. Let me start by saying that I love it. I especially love wearing it. That said, you should probably sit down and pour yourself a drink before reading the next part. The Pendleton Cowl is a fair isle style stranded knitted cowl worked in laceweight yarn. Now just breathe... It is actually not hard at all to do. I found it pretty fun even! Inspiration: An Oregon institution since 1863, Pendleton Woolen Mills sets THE standard for fine wool blankets and clothing. 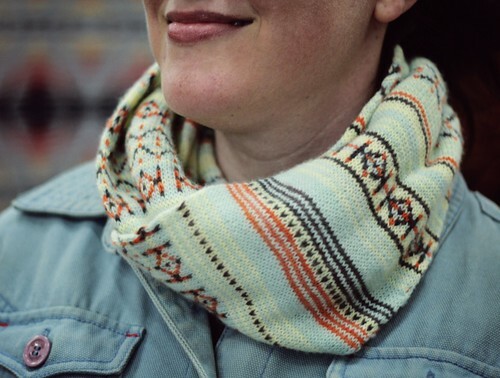 This cowl is a tribute to the designs and patterns found in classic Pendleton blankets. Make it traditional and knit it in vintage-inspired colors as I did, or make it modern with a contemporary palette. The Pendleton style is timeless! This medium-level pattern is worked in the round with four colors. It includes stripes and charted stranded Fair Isle-style colorwork. The cowl starts with a provisional cast on, is a knit in the round as a tube, then grafted together at the end. The yarn in the sample is Malabrigo Lace - a lovely baby merino wool that is so incredibly soft. You’ll need four different colors to follow the pattern as written. I chose a light, a dark, a bright and a neutral. Feel free to play with your own ideas! Photography by Vivian Aubrey. (Thank you Vivian!) We had so much fun when we went to the Pendleton shop to take these pictures. 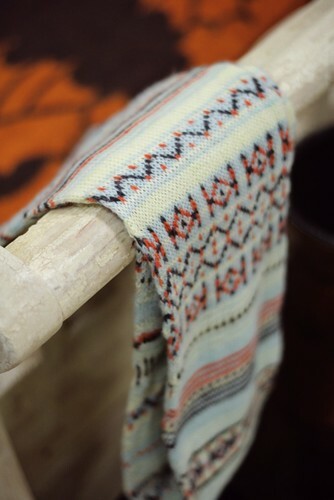 Vivian even picked up 8 pounds of fine wool scraps in a lovely soft blue and tan plaid pattern to make a braided rug. I can't wait to see that! I hope you like the cowl - I am really happy with the design and feel. Thanks for spending some time with me today. Want more? 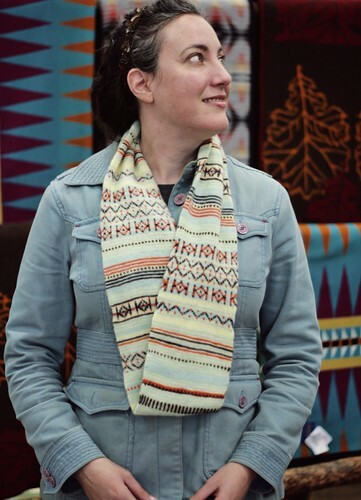 This pattern is part of the Stumptown Knits Collection: a monthly pattern club featuring 6 accessory patterns inspired by the place you live and the place you love. For me, it's Portland, Oregon. When finished, the club will be compiled into an e-book. The e-book will be included in the cost of the club for those who join. Half the cost of buying the individual patterns. Individual patterns as well as finished e-book (at the end of the club) can be stored in your Ravelry library. Knit-a-longs! This time we will have official knit-a-longs each month with prizes! See my group here for info. 20% off discount codes to use at Twisted. All of the yarns used in this club are available for purchase there and if you want to match the yarns I’m using, you can! This is absolutely stunning! I mean it!! Not biased!! I can't wait to try my hand at it. That's beautiful and unusual! love it!